Chess is a beautiful game. The structure of the pieces, the layout of the board, the mind gymnastics needed to play, the elegance of the sport. 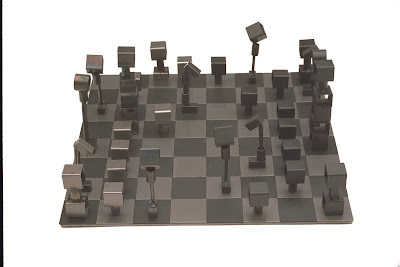 Julie Feldman has designed a fantastic chess set. The metal is industrial and modern, the lines are simple and elegant. The gray on gray is classic and clean and would fit in the most casual space as well as a formal one. I’m simply in love with this set. I just want to focus on this chess set. This entry was posted in Tchochkes by Shira Abel Shvo. Bookmark the permalink. 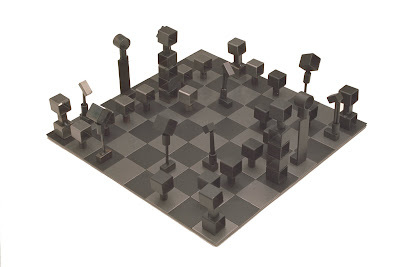 This chess set is just beautiful. I knew Julie was a handbag designer but didn’t realize she was so creative in other ways…what a talent! I still remember my first cool Italian marble chess set i got when i was 15. still have it mostly together.